Sebastian Pruiti, in his debut post on DraftExpress, takes a look at the strengths and weaknesses of Jimmer Fredette, with the help of BYU game-film from this past season. -	Shooting Ability: The fascination with Jimmer Fredette starts with his shooting ability, where he seems to show unlimited range, and is a threat to take and make a shot as soon as he crosses half-court. The type of shot doesn't matter to Fredette, who can knock down threes off of the dribble, coming off of screens, or in catch and shoot situations. Within BYU's offense, Fredette has the freedom to shoot whenever he wants, and that is such a threat to the defense because he can knock down both open and closely contested shots consistently. -	Midrange Shooting: Fredette's ability to knock down contested shots while off-balance is extremely beneficial. Fredette's shooting ability and freedom to pull up at any moment keeps the defense off balance and this allows him to get shots up over longer, more athletic defenders. -	Passing: Clips of Fredette attempting long pull-up threes have given him the reputation as a selfish gunner, but this is hardly the case. Yes, BYU's offense started and finished with Fredette, but he always seemed to be a willing passer, able to hit the open man if the defense starts to focus too much on him. In addition, Fredette is a strong enough ball handler with either hand to get himself to spots on the court where he is a threat, forcing help. When that help comes, Jimmer is able to get the ball to the open man. -	Defense: For Fredette, the biggest concern for scouts is on the defensive end, and rightfully so, since playing defense is his biggest weakness. Fredette's average, at best, athletic ability really hurts him on this end as his poor lateral quickness allows him to get beat by quicker ball handlers. Despite not having the tools to play tough defense, the most worrying thing might be his mindset on the defensive end. Fredette almost seems disinterested defensively, and this leads to poor help and poor positioning off of the basketball. Even worse, when he does get beaten by his man with the ball, he tends to give up instead of trying to recover, hoping that his help can get the job done. -	Finishing At The Rim: Despite showing a nice mid-range game that should translate to the NBA well, Fredette could have trouble finishing in the paint at the next level. While he might be crafty enough to finish over his man, he has struggled at times finishing over help defenders. Fredette doesn't always have the athletic ability to finish with help coming, so he is forced into double-clutched, circus-style lay-up attempts. This puts the basketball on a tee for the help defense to block it, and if he does get it over the help, there is a small chance the ball actually goes in. -	Turnovers: Despite having strong offensive instincts and displaying an ability to make the correct pass more often than not, Fredette still tends to turn the basketball over a little too much. Fredette's Pace Adjusted Turnovers Per-40 minute average of 3.7 was 23rd highest in the NCAA last season and his Assist to Turnover ratio and Pure Point Rating were also very low (1.22 and -1.92 respectfully). A lot of these turnovers tend to be a direct result of how much he dominates the basketball and how much BYU's offense relied on him. When Fredette turns the basketball over, it is usually when he is trying to create on his own. One of most pleasant surprises in college basketball this season, Jimmer Fredette was nothing short of spectacular all season long. Though he couldnt save the Cougars against Kansas State last week, no one can question his ability to put his team on his back and carry them to victories. 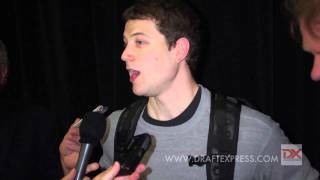 With his season coming to a close, Fredette now faces his impending draft decision. A controversial prospect, Fredette has one of the most impressive offensive packages in college basketball, but may lack the athleticism needed to translate his skill-set seamlessly to the next level. Throughout the season, and especially during MWC play, Fredette was able to consistently and efficiently compensate for his lack of elite explosiveness and leaping ability with excellent body control, a great understanding of how to subtly change speeds and directions to lull his defender to sleep, and a crafty array of shots around the basket. To a much greater extent than the average slow-footed, undersized scorer, Fredette is comfortable in his own skin. A quarter of his offense was comprised of one-on-one situations according to Synergy Sports Technology, and he finishes at a near-50% clip at the rim a testament to his ability to overcome his weaknesses. Exceptionally good at not only finding creases to beat his own man, Fredette does a great job reading help side defenders and attacking his man in a way that shields him from weak-side roations. Whether he can make a comparable impact at the next level is something that teams will likely want to study in private workouts against more physically gifted guard prospects. Posessing a strong frame and the ability to surprise defenders with his agility and balance when changing directions in the lane, Fredettes athleticism isnt as much of a concern on the offensive end as it is defensively. With no shortage of toughness or aggressiveness, Fredette plays a sound brand of defense, but his limited physical tools hurt him considerably and would likely make him a significant target to isolate against on the perimeter at the NBA level. Appearing a step slow closing out, not possessing the size and length to bother shooters or be a factor in the passing lanes, and lacking any real lateral quickness, Fredette was able to get by in BYUs zone and play effective man defense on occasion. However, with the NBA handcheck rules neutralizing whatever strength advantage he could potentially try and use over his matchups on the next level, he projects as a defensive liability at the next level, any way you slice it. Should he keep his name in this draft, his ability to defend is likely the facet of his game that teams will attempt to evaluate most thoroughly in private settings. Though there are aspects of his game that remain question marks from an NBA perspective, there are others that have talent-evaluators enamored with his game. Fredette has improved his jump shooting ability markedly since his freshman year, and now sits as one of the best shooters in our database. A tremendous catch and shoot threat who has also improved his ability to hit shots off the dribble, Fredette can certainly help a team on any level with his ability to stretch the floor. His efficiency from the line is a bonus as well, as hes a valuable asset in late game situations. Aside from his merits as a shooter, Fredette has improved his efficiency as a passer as well. Though his usage has risen markedly from last season, Fredettes assist to turnover ratio has grown from 1.59 last season to 1.84 this season. Given his tremendous basketball IQ, it will be interesting to see how Fredette responds to a diminished role on the next level. Hes a solid passer, but his ability to set his teammates up and play low-mistake basketball will only help his cause as he carves out a niche for himself early in his career. Considering what hes accomplished this season and the struggles he will face in terms of improving upon his weaknesses, Fredette faces a difficult decision on whether to leave his name in the upcoming draft. Its difficult to see how much better of a year he could have (even though he was diagnosed with mononucleosis midway through the season), and hes unlikely to get significantly more athletic over the offseason. With a lot to gain from performing well in private workouts in a weak year for point guardsbut very limited amount of time to actually test the waters due to new rules the NCAA implemented-- Fredette is a name to keep an eye on in the draft process.